In food processor bowl with metal blade or blender container, combine all dressing ingredients; process until smooth. In large bowl, combine all salad ingredients. Just before serving, add dressing to salad; toss gently to mix. Chipotles add a spicy hot and smoky flavor to foods. To increase the heat, double the amount of chiles. Chipotle chiles in adobo sauce can be found in the Mexican-foods aisle of the supermarket or at a Latino market. The dressing can be made ahead and refrigerated until use. 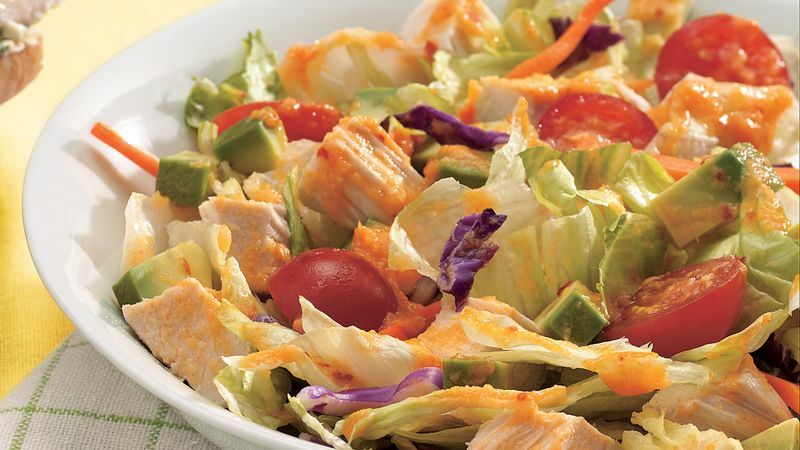 Accompany this salad with tortilla chips. Offer a try of brownies for dessert.